This past week, my granddaughter, Cissy, spent four nights with me while her Mom was out of town on business. We had so much fun, and for one of those evenings we were invited to a LA Tea DA! tea party at a nearby church. All the tables were decorated to a theme, and they were so pretty. 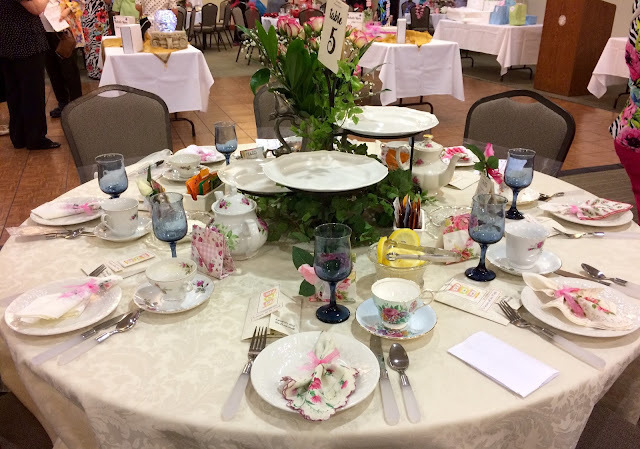 The friend that invited us to the tea party decorated our table. Doesn't it look pretty? We all had party favors with a rose corsage in the front envelope of the little box. Also included in the darling box, were various teabags. The tables were numbered because we voted on our favorite one. Cissy and I also loved this one that had a fairy garden theme. We had to leave early in order to get Cissy home for bed, and we didn't find out which table won. Several of the ladies would ask Cissy if she liked a certain a food, and she was honest, and said, "I'm just a child". I have to say that her favorite thing was the strawberry mini cupcake. Our hostess (or "Mum") for our table fixed a plate of sweets for Cissy to take home. We had a wonderful evening! You both look beautiful and I love your top Kitty! What a fun evening to spend with Sissy enjoying a delightful tea party at those beautiful tables. Hi Kitty, wow that tea party looks like it was a lot of fun that you and Sissy went to. I love the way the tables are decorated. Kitty, it looks like you and Cissy had a wonderful time. What pretty tables. The desserts look lovely! Your tea party looked absolutely lovely and now I'm yearning to go to one myself. I have always had a passion for tea parties! I hope you have a wonderful and blessed week! Such a beautiful event for you and Cissy to be a part of! How sweet of your friend to invite you! I can tell that it was a lot of work to put this event on, but surely a beautiful time for all! The menu sounds amazing! And how sweet that your friend made a plate of sweets for Cissy to take home. I think Cissy looks like you, both of you are beautiful, radiance shining from your hearts :) Hugs to you today! Such a lovely evening, Kitty. So glad Cissy got to join you. Cissy has such a fabulous smile! I can imagine her comment being very charming. Looks like such a fun evening for the two of you and it certainly was beautiful with many delicious treats. 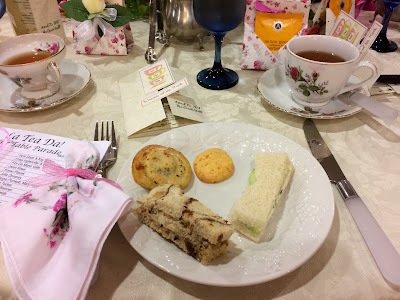 What a fun tea party to attend with Cissy! I always enjoy seeing the different themes of each table. How were the herbal teabag cookies? The Event looks like so much fun! So incredibly sweet, Kitty! Cissy is learning so many life skills with you as her mentor. I loved your table - looks like vintage hankies as your napkins? Happy May Day to you! You are making wonderful memories with your grands! Pretty tables. My church is having a tea party on the 13th and I'm setting a table in blues and birds theme! I will certainly take photos. Well how exciting you got to share that evening with your Cissy! The tables are gorgeous. I have decorated theme tables before and know they are such fun. Sounds like a memorable evening together. Thanks for sharing the menu!! Look how beautiful the both of you are!! I LOVE this photo of you two. What a delightful tea party, La- Tea- Da isn't that darling. p.s. You BOTH look fantastic!!! Kitty, this is so sweet and building childhood memories. What a lovely treat! Your granddaughter will always remember this special day too. How precious. Oh how wonderful that you got to do this together Kitty. I am sorry to say that my little grand isn't too much interested in my tea time passion. Maybe that will change along the way. She is 13. This was precious! Thanks for sharing. What fun to share such a tea party.... it will be a precious memory for her...and for you. :) The tables looked great. Oh how absolutely stunning!! 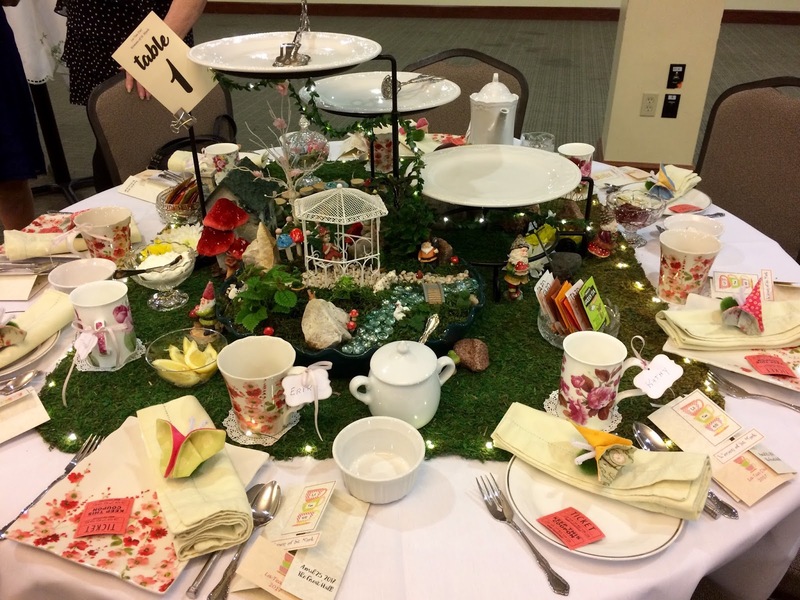 What a brilliant idea to have tables decorated individually and then vote on the favorite! Did you get to keep those vintage hankies (or were they napkins?)? Love it all and LOVE your top!!! You both looked so beautiful. Kitty, that looks like so much fun! Oh Kitty, what a joy to spend the evening with your granddaughter. Sharing tea time with this sweet little girl must be grand. Kitty, what a lovely event! How I would have loved going to a tea party with my grandmothers when I was Cissy's age. Her "I'm just a child" made me laugh! Lovely tea party! I think you both have the same beautiful smile ! Hi Kitty, what a sweet photo of your and your darling grand daughter. How special to enjoy a evening of tea together. The table looks beautiful. These are the times she'll always hold dear in her heart spending time with you. 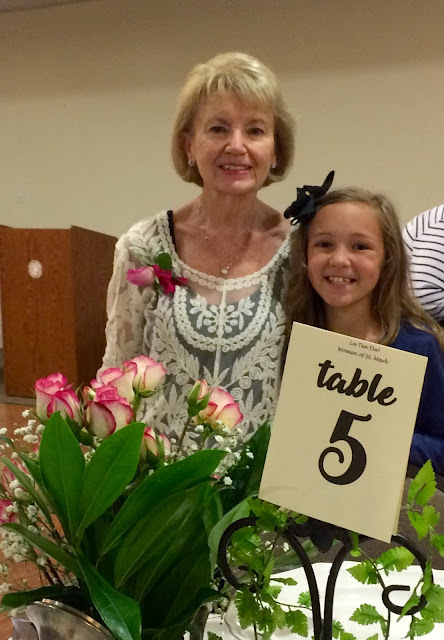 My kind of event, grandma and one of her sweet granddaughters out for tea! I like the themed tables and you two look absolutely radiant. Pretty helpful information on your evening tea party. Last month, I arranged a weekend brunch party with my family at one of the grand event venues around. Made wonderful arrangements along with a table centerpiece and enjoyed a lot there. Oh my goodness, Kitty, what a lovely evening tea, and the food sounds delish! I always get hungry when I visit your blog. :D Cissy looks like she is having a ball; I bet your grandchildren just LOVE to spend time with you. I think it's wonderful how much you truly enjoy your grands. By the way, you look very pretty, Kitty -- so glad you had a nice evening. You are making such wonderful memories!! I am glad you get to spend time with her. I am glad she enjoys baking with you too! !